Both clinicians and researchers understand how difficult it can be to implement audiology research in the clinical setting. Some studies show a lack of adherence to new procedures even after appropriate scientific evidence has been presented in support of those procedures. In spite of this problem, we should understand the reasons behind it and think about strategies for changing this scenario. For instance, a research1 study found that the majority (77%) of 249 audiologists from the United States reported that they never performed multi-frequency or multicomponent tympanometry and their main reasons for not doing so included lack of equipment (52%), lack of training for performing the tests (55%) and interpreting the tests (60%), time (23%), equipment cost (21%), clinical relevance (13%), and reimbursement (15%). The Canadian Guidelines on Auditory Processing Disorder (APD) in Children and Adults2 highlight some challenges in this area of practice. A survey found that 55% of audiologists reported that they do not offer auditory processing assessment. Many audiologists indicated that their practices were busy with other areas or they were not interested in this field. Thirty-seven percent reported not feeling comfortable with their knowledge base in auditory processing. Other reasons included were: they were not comfortable providing recommendations or intervention (25%), the absence of follow-up services in their community following the assessment (23%), and they were not comfortable with the sensitivity/specificity of the tests (20%). Besides the difficulties reported by audiologists in performing auditory processing assessment, normative data is a topic that deserves attention, as it is essential for clinicians to perform and analyze their procedures. The American Academy of Audiology (AAA)3 points out that no matter how efficient a test may prove to be, it should have appropriate normative data. The British Society of Audiology (BSA)4 in their Position Statement and Practice Guidance about Auditory Processing Disorder (APD) identifies the need for “gold standards” for diagnosing and managing APD. Choosing the most suitable test battery is another important topic of discussion. A survey5 found that the most popular tests performed in clinical auditory processing assessment were dichotic, monaural low-redundancy speech, and temporal processing tests. Tests that use speech as a stimulus were the most mentioned. Nevertheless, the outcomes of these tests may reflect language-related skills and not only the listening skills of an individual.6 Equally important is the consideration that beyond language, attention and working memory are involved in speech perception tests.4 Tests used in the assessment of APD are frequently confounded by cognitive effects such as memory and attention, and by the use of verbal reproduction as a form of response selection.7 These confounds can be minimized if computer-controlled forced-choice psychophysical methods were employed, helping to eliminate ambiguities of interpretation, avoiding unwanted confounds, delineate perceptual from cognitive processes, and avoiding indeterminate diagnoses.7 Therefore, a new generation of audiological assessment procedures that are clinically viable needs to be developed. Recently, the National Centre for Audiology (NCA)/Child Hearing Research Laboratory has been funded by an Ontario Research Fund (ORF) grant to enable the development of psychoacoustic tests for spectral, temporal, and binaural assessment in collaboration with an industry partner (Clearwater Clinical Limited) so that they can be used in clinical practice. Two test and two test results of the iPad-based Psychoacoustic App Suite (iPAAS) are shown in Figure 1, Figure 2, Figure 3, and Figure 4, respectively. Ottawa-based Clearwater Clinical designs and manufactures innovative medical-grade devices, including SHOEBOX Audiometry, that leverage the power of tablet technology to enable effective, alternative approaches in hearing healthcare. Figure 1. 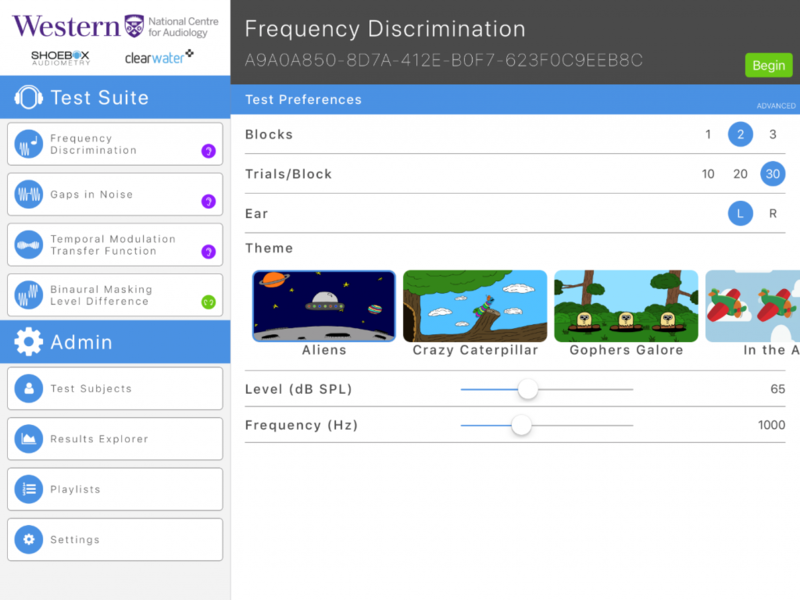 Example of frequency discrimination test with different themes available. Figure 2. Example of amplitude modulation discrimination test with different themes available. Figure 3. 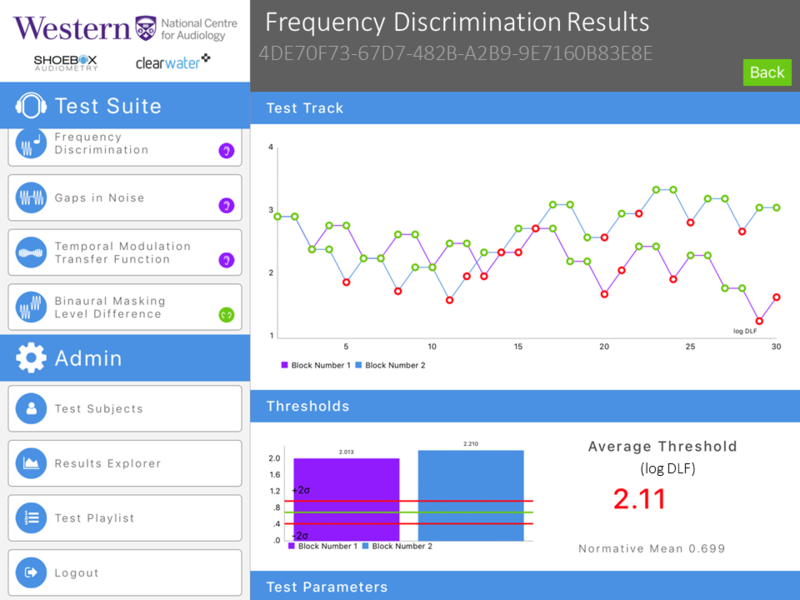 Frequency discrimination threshold tracking example (typical result). The threshold is shown in log DLF. Figure 4. 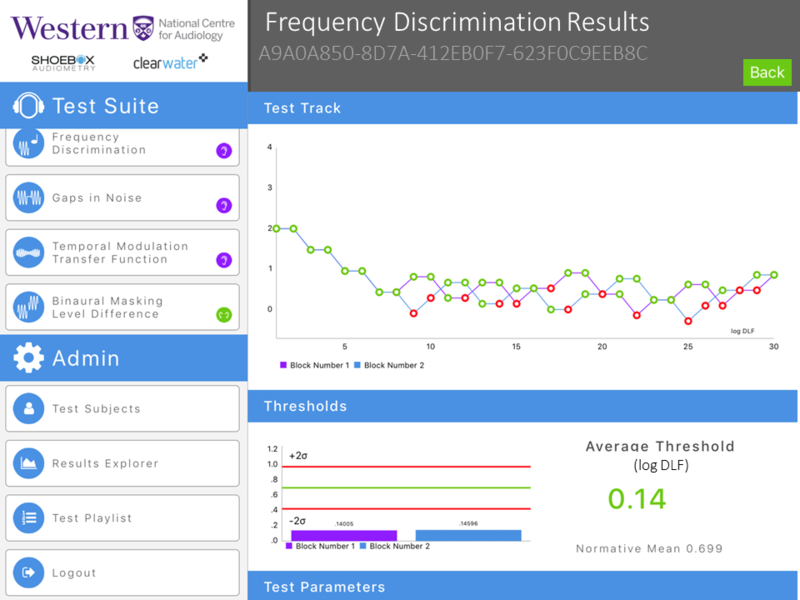 Frequency discrimination threshold tracking example (atypical result). The threshold is shown in log DLF. At the Child Hearing Research Laboratory, at Western University, psychoacoustic tests for spectral, temporal, and binaural assessment have been studied8,9 and were administered to both clinical and normal population as part of a comprehensive auditory processing assessment. The partnership between Western University, the National Centre for Audiology, and Clearwater Clinical will promote the development and implementation of psychoacoustic tests that have been utilized successfully in a research environment and transform them into products that can be easily implemented in a clinical setting. One of the important steps in this process is to employ a dynamic, iterative integrated Knowledge Translation process (iKT)10 in order to better understand clinicians’ impressions about this new platform for auditory tests. Working under the supervision of Dr Prudence Allen, Dr Sheila Moodie, Dr Vijay Parsa and Dr Chris Allan, and others, we believe that after identifying possible gaps between a knowledge product (the tests) and the end users (clinicians) we can promote a successful implementation of the tests. Clinical audiologists play an important role in our research plans as we study how to best integrate the tools for advanced diagnostic tests into the clinical practice setting. For this project, the clinicians will be provided with the APD tests that have been implemented onto an iPad, a short introduction to the tools, a brief training, and a user’s guide. After assessing the platform, they will give us feedback regarding the layout and usability, test measurements and how to integrate them to facilitate clinical decision making, along with barriers, and facilitators to implementing or utilizing the tests. We will also gather information about their demographics and current practice patterns. The materials that will be employed in this study are shown in Figure 5. By doing this prior to general release to clinical practice, we expect to see a reduction in the barriers to implementation and have as an end result a clinically useful tool more suitable for clinicians and their patients. Figure 5. Materials that will be employed in the iKT study. 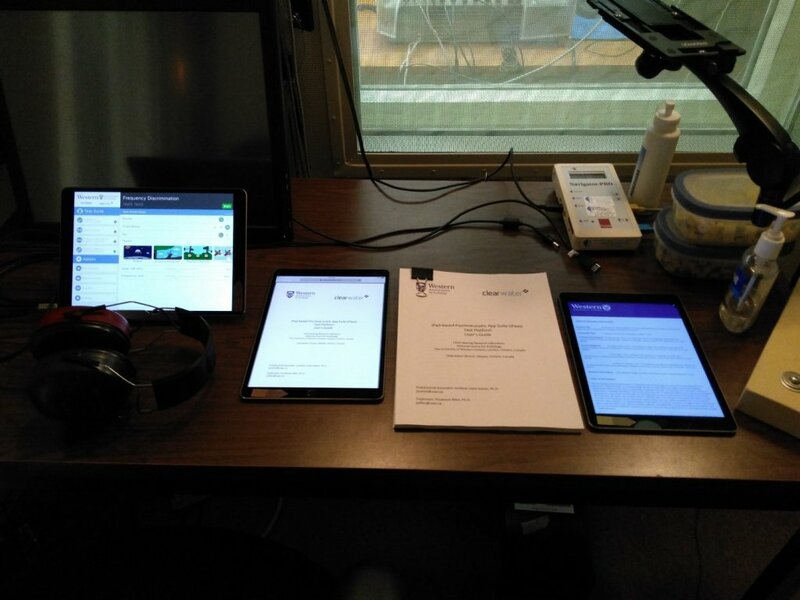 From the left to the right: iPAAS platform showing as an example the Frequency discrimination test, the electronic user’s guide for the platform, a paper version of the user’s guide, and an electronic survey. The NCA has used the iKT process and collaboration with clinicians and partnership with industry successfully in several other projects including the development of the Pediatric Audiological Monitoring Protocol (UWO PedAMP v1.011,12), and the Ling 6(HL) test.13 Both of these studies provided feedback to the research team that facilitated further development and led to faster uptake of the outcome tools in clinical practice. The implementation of a new tool may be influenced by fifty different factors distributed in four major groups as follows: the characteristics of the innovation, the practitioner, the context, and the broader health care system.14 In this way, it is not difficult to understand how challenging it is to implement new research findings in the clinic. The iKT process identifies the steps and a framework to synthesize evidence to develop knowledge products (in the current example, the psychoacoustic tests) as well as translate that evidence into uptake in clinical practice. An important component of the process is that the knowledge and the final product become tailored over time and customized ideally with input from the end users, to facilitate implementation. This is the great value of the iKT theory: employing a collaborative approach considering values, preferences, and determinants to implement change in clinical practice. Also, an analysis of the barriers and facilitators of implementation can be used to develop a product that is of high-quality, effective, and efficient at delivering the best services to the public. I would like to acknowledge the input and discussions of Dr Allen, Dr Moodie, Dr Parsa, Dr Allan, and the Postdoctoral Fellow Sangamanatha Ankmnal Veeranna, PhD. Emanuel DC, Henson OE, Knapp, RR. Survey of audiological immittance practices. Am J Audiol 2012;21:60–75. American Academy of Audiology. Clinical Practice Guidelines Diagnosis, Treatment and Management of Children and Adults with Central Auditory Processing Disorder, 2010. Available at: https://audiology-web.s3.amazonaws.com/migrated/CAPD%20Guidelines%208-2010.pdf_539952af956c79.73897613.pdf. British Society of Audiology. Position Statement and Practice Guidance Auditory Processing Disorder (APD), 2018. Available at: http://www.thebsa.org.uk/wp-content/uploads/2018/02/Position-Statement-and-Practice-Guidance-APD-2018.pdf. Emanuel DC, Ficca KN, Korczak P. Survey of the diagnosis and management of auditory processing disorder. Am J Audiol 2011;20:48–60. Moore DR, Cowan JA, Riley A, Edmondson-Jones AM, Ferguson MA. Development of auditory processing in 6- to 11-yr-old children. Ear Hear 2011;32:269–85. Cacace AT, McFarland DJ. Factors influencing tests of auditory processing: a perspective on current issues and relevant concerns. J Am Acad Audiol 2013;24:572–89. Gokstorp LA. Frequency discrimination and auditory learning in children. London, Ont. : Faculty of Gratuate Studies, University of Western Ontario; 2003. Graham ID, Logan J, Harrison MB, Straus SE, Tetroe J, Caswell W, Robinson, N. Lost in knowledge translation: time for a map? J Contin Educ Health Prof 2006;26:13–24. Bagatto MP, Moodie ST, Malandrino A, Richert F, Clench D, Scollie SD. The University of Western Ontario Pediatric Audiological Monitoring Protocol (UWO PedAMP). Trends Amplif 2011;15:57–76. Moodie ST, Bagatto MP, Miller LT, Kothari A, Seewald R, Scollie SD. An integrated knowledge translation experience: use of the Network of Pediatric Audiologists of Canada to facilitate the development of the University of Western Ontario Pediatric Audiological Monitoring Protocol (UWO PedAMP v1.0). Trends Amplif 2011;15:34–56. Glista D, Scollie S, Moodie ST, and Easwar V, The Network of Pediatric Audiologists of Canada. The Ling 6(HL) Test: typical pediatric performance data and clinical use evaluation. J Am Acad Audiol 2014;25:1–14. Moodie ST, Kothari A, Bagatto, MP, Seewald RC, Miller LT, Scollie SD. Knowledge translation in audiology: promoting the clinical application of best evidence. Trends Amplif 2011b;15:5–22. Jordana C. Soares works currently as a postdoctoral associate at the Child Hearing Research Laboratory in the National Centre for Audiology at Western University, Ontario. She received her Doctorate, Master and Undergraduate degrees from University of Sao Paulo, Brazil, where she researched hearing assessment in newborns and children. She started to practice audiology in hospitals and private clinical settings in 2002.